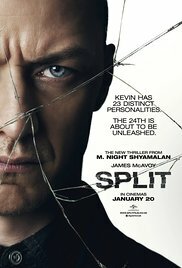 My film of the month this month is Split which was released into UK cinemas last year. James McAvoy’s performance is incredible, it is a thriller/horror by M Night Shyamalan, director of The Happening, The Village and of course Unbreakable. If you like horror, then this is definitely worth a watch. McAvoy has already been nominated for best actor by MTV Movie + TV Award and i’m sure will be getting more nominations as he is simply incredible in playing 24 different identities. Supporting actresses Betty Buckley and Anya Taylor-Joy give solid, emotional performances too. It is beautifully written, produced and performed and promises to keep you on the edge of your seat.